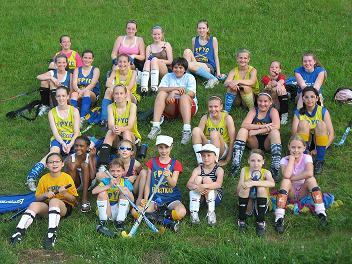 Welcome to FPYC Field Hockey! FPYC Field Hockey will kick off on Sunday, March 31st at Fairfax High School. Registrants will learn the game of field hockey in 8 clinic sessions from experienced high school coaches, high school players, former high school players and former college players. Registration is open for girls and boys in Grades 3 - 8. Players are grouped by age and ability. We will have 3rd/4th 5th/6th grade teams (Beginner and experienced), 7th/8th grade teams (Beginner and experienced). We will play Sunday evenings between 5:30 - 7:30 pm including both skills and scrimmages. *** Some sessions in May will be at an alternate time and/or location. ***We will also play against teams of the same level and age group from other local field hockey clubs. The fee for this year is $100 for the first player and $80 for each additional sibling. Each player will receive a reversible mesh FPYC jersey and a t-shirt. There is a $25 late fee for registrations after February 25th!! VOLUNTEER - It's easy and fun. Adult volunteers will be assigned 2 high school aged helpers to assist and teach. A curriculum of drills is provided each coach for each session. We need adults - particularly those who have played before (even if it was 20 years ago!) Consider signing up as a volunteer! At FHS 5:30 - 7:30 pm March 31st, April 7th, April 14th, (No session on Easter! ), April 28th, May 5th, May 12th, May 19th, and June 2nd (Play Day at FHS 3p - 8p). Walk-in Registration - John Rusert Club House Providence Park, West Dr., Fairfax City, VA.